Jaime: What inspired you to start NyanPon's Knits and Crochet? Do you sell your patterns or finished crochet pieces? Nyan: I did used to have an Etsy store under a different name. I sold knitted tails and ears, but when I learned to crochet I added amigurumi that I had designed. (I didn't know how to read crochet patterns for a long time so I always made my own). I tried to branch out and do craft fairs, too. I found it was too much money spent for the money earned. I enjoyed making things, not filling out tax forms and doing paperwork. I opened NyanPon's Knits and Crochet to showcase the patterns from the items I used to sell/trade. Blogging my patterns made me happy. When I ran out of my original patterns from my store's items I was already getting requests. People enjoyed my patterns! I was hooked. Jaime: You are NyanPon!! You design bags, scarves (which I adore, btw! 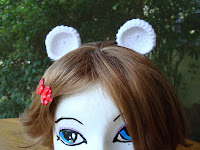 ), hair clips and capelets, but you also do highly realistic amigurumi food, and then there are the ears and tails patterns you mentioned! Does that kind of awesome diversity help to keep you inspired? Nyan: Ears and tails are the joys of my life. I hope I never grow too old to enjoy wearing them. Many of the early patterns from the blog are my old patterns I made for myself. The first food items were made for a friend's daughter. I posted the patterns because they were cute. I got so much good feedback and requests for new items. I discovered that I had a gift for making amigurumi food. I think food is one of my favorite things to design now. Most of my other patterns came to me out of necessity. Need a new market bag? Don't have the concentration to follow a pattern? Make one. See a cool wig hat, but there aren't many cool free patterns? Make one. Since I have been unemployed for close to 4 years now I don't have much extra money, so I pay it forward. I know there are many other people in the same situation, too. Money is tight, and sometimes $5 for one pattern could mean not having the money for that extra bit of groceries. Jaime: Why do you crochet? Nyan: Idle hands are the devil's workshop, or that is what my art/craft teacher mother always told me. Some people play Angry Birds, I craft. Amazingly I still cross stitch, knit, bead, sew, and draw (as well as working on many other hobbies like juggling, cooking, and gardening). I tend to go slightly stir crazy if I am not working on something, I may need to go to the doctor and get checked for OCD. Crochet is just my newest passion. Crochet Geek's videos have been a lifesaver to me, without them I never would have learned to double crochet. I love trying new patterns to learn new techniques. Often when I make something new I see how the technique would make an idea I had be even better and incorporate that technique into it. Jaime: Okay, so I have to ask... What does Nyan-Pon mean? Nyan: Neko is the Japanese word for cat, nyaa or nyan are sounds a cat makes. Pon is like chan, it is a affixed to the end of a name by a close friend or family member. If you call me Nyan-pon, it is affectionately calling me little cat or Kitten. I will point out it is childish to add your own suffix to your name. I would introduce myself as Nyan, you as my friend might call me Nyan-chan or Nyan-pon. Jaime: As a relatively-new blogger, I find that I struggle with finding balance in my life. I've got a regimented, every-other-day posting schedule that helps, but how do you find balance between your life online and your life at home? Nyan: Well, I don't have a life so it is easy for me. *hehe* Okay, not quite true. I don't have children and I am a homemaker, so I do have spare time between my daily 4-5k walks and cooking/cleaning. You might say crochet and blogging is what keeps me sane. I like to post 2 patterns a week, sometimes I get inspired and do more, sometimes I feel blah and only post once or not at all. I try not to force myself because that is when I get pattern block. Jaime: My last question: What super-secret projects are you working on right now? Thank you so much Nyan-pon for being my very first Showcase Saturday victim guest! When she's not posting on her blog, you can find her on Facebook (go HERE and Like her while you're there, would'ja please! ), and also on Ravelry as NyanPon! Now, go check out her patterns because they rock! Shoo! Yay! Looks so good. Thanks so much for putting up with my crazyness. Sending purrs. Love the green eggs and ham..... And strawberry shortcake! nom-nom-nom! oh! and I just looked at the ravelry link -- HAHAHA! I think I remember seeing the zombie blood pattern there before -- how AWESOME!! Could this be another "evil twin"? haha! ;) Great to meet you, Nyan!